This feels like a moment of truth. For many years people have been warning that we live in extraordinary times, a change of age not just an age of change. International Futures Forum (IFF) has been amongst them - quietly advocating the need for radically different approaches to intractable problems in a world where we are off our familiar charts. Although hugely rewarding and inspiring, the work of Graham Leicester and his colleages in the IFF has so far sat on the fringes of the main event. Business as usual has maintained its steady course, as powerful systems generally do. Now things feel different. Talk of change is everywhere and so is talk of meltdown and chaos. The Nobel economist Paul Krugman recalls similar sentiments expressed by Keynes in the 1930s 'We have involved ourselves in a colossal muddle, having blundered in the control of a delicate machine, the working of which we do not understand.' As Krugman says, 'both statements are as true now as they were then'. Maybe this is the turning point - when the bankruptcy of conventional wisdom becomes clear? We can acknowledge that we are confused and that times are hard. But we don't tune the confusion out or deny it. Instead we find the courage to face it head on and the determination to learn and grow our way through it. And when we commit to that path it is astonishing how often we discover strengths we did not think we had. Learning means taking a wider view, and that can be scary. But when we are able to do so it allows us to reperceive the way things are. We begin to see the present financial crisis as just one more symptom of a world we no longer understand and cannot control. As such it may serve as a wake-up call to those who still think today's problems can be satisfactorily addressed with yesterday's solutions. 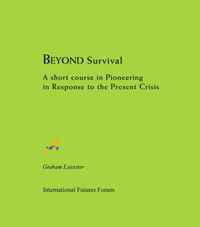 This short pamphlet outlines in four lessons the elements of a strategy for emerging from the current crisis stronger. The first step is survival. The next is generating fresh insight. The third is maintaining the will to act and to persevere. And finally the story is about hope, without which we cannot even start the journey.